To view portrait miniatures currently for sale at Philip Mould & Co, please go to www.philipmould.com. 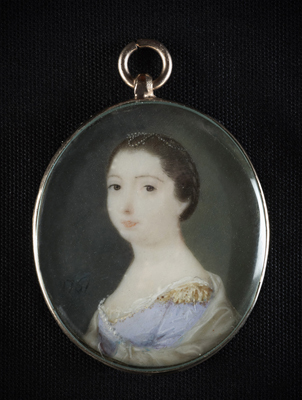 This hitherto undocumented portrait miniature by John Smart of Frances, Lady Neave (d.1830), is one of the earliest examples of the artist’s work, and is an incredibly important re-addition to the artist’s oeuvre. In 1755, at the age of thirteen, Smart began to enter pencil and chalk drawings for prizes at the Society of Arts. After coming second to Richard Cosway in the first competition he went on to secure first prize in the following three. In 1761, the date of this miniature, Smart had been working as a professional artist for one year, practicing from premises in Dean Street, Soho, London. At this stage in his career he was a rival to the equally young Richard Cosway but his miniatures are markedly different. His attention to detail and refusal to flatter meant his clientele came largely from the affluent middle classes. The business appears to have been remarkably successful in a short time, with Smart working hard to secure large numbers of sittings. Smart continued to gain much fame for his miniatures, moving to India in 1785 to secure new, wealthy clients. He came back to London in 1795 and quickly re-established himself as one of the most talented miniaturists in the country, exhibiting many works at the Royal Academy. He died after a short illness at his home in Russell Place, Fitzroy Square, London on the 1st May 1811. The ability to firmly identify this portrait of Lady Neave allows a previously impossible glimpse into the social circles young Smart was penetrating. Frances, Lady Neave, was the wife of Sir Richard Neave, 1st Baronet (1731-1814), a director of the Bank of England for forty-eight years before being made deputy governor in 1781, and then subsequently Governor in 1783. On 13th May 1795 Neave was created a 1st Baronet of Dagenham Park, Essex. This type of wealthy clientele would have been a real achievement for Smart, who would have relied heavily on the recommendations of these early patrons to further his career.